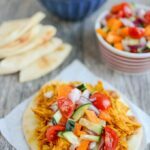 This Persian Pulled Chicken is a simple healthy recipe that can be made in the slow cooker or instant pot. It’s full of flavor and great served over rice, on a pita, in a wrap or over a salad for a quick lunch or dinner that can be prepped ahead of time! In a medium bowl add chicken broth, tomato paste, turmeric, curry powder, cinnamon, salt and pepper. Whisk to combine and set aside. Place a sauté pan or a stove-top safe slow cooker pan on to the stove on medium-high heat. Add olive oil and onions, sauté for 5 minutes or until onions are translucent. If using a sauté pan add cooked onions to slower cooker then layer on chicken, then pour liquid and spice mixture over the chicken. Set slow cooker to low for 6 hours. Once cooked shred chicken using a fork or the back of a large spoon. Serve on top of cooked rice, or in a pita with diced tomatoes, cucumber and onions and plain Greek yogurt. You can use frozen chicken in the slow cooker, but increase cooking time to 8 hours. To cook in the Instant Pot, reduce chicken broth to 1 cup, saute onions in oil using saute function on IP for 5 min. Add chicken and broth mixture. Usual manual mode to set for 12 minutes. Use quick release and check to see if it shreds easily with a fork. If not, set for an additional 2-3 minutes.